At certain times of the years, ants seem to appear in the kitchen and garden from out of nowhere. While one or two ants is no big deal, if you begin to see a large number, you need to take quick action for ant removal. However, with small children, animals, and food in the home, it is important to learn about repelling ants naturally. The same applies for a garden in that you do not want to use anything toxic on the foods that you are growing. Fortunately, there are several viable options for repelling ants naturally. These suggestions have worked for many people, but remember, if you are not getting results, you need to turn to a professional pest control company. 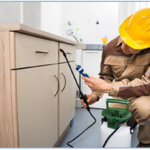 A reputable company that offers pest control in Toronto can eliminate the problem once and for all. Bagged Sliced Apple – Especially when dealing with odorous ants, which are commonly found in kitchens, take a small plastic zipper bag and poke about 10 small holes in it. Then, cut an apple into several pieces, place them inside of the bag, seal the bag, and then place it where you have seen ants. These ants love sweets, so they will be attracted to the apple, but after getting inside the baggie, they will not be able to escape. Borax and Powdered Sugar Bait – A great homemade bait recipe consists of one part of Borax mixed with three parts powdered sugar. Spoon a small amount of the bait mixture into small lids taken off plastic water or soda bottles. Again, place the caps around the area where you have noticed ants inside the kitchen. White Vinegar – Place a small amount of white vinegar in a spray bottle and use it on kitchen countertops, along any cracks, around baseboards, and at the base of exterior doors. Diatomaceous Earth (DE) – For carpenter ants messing with your garden or hanging around outside of the home, fill an eyedropper with food-grade DE and carefully squirt it dry into cracks where you see the ants nesting. Borax, Sugar, and Peanut Butter – Yet another bait solution for outdoor ants is made with 1 teaspoon of peanut butter mixed with 1 tablespoon of table sugar and 1 teaspoon of Borax. Cut several straws into thirds, filling both ends with a small amount of the mixture. Then, please the straws along ant trails. If you have tried these natural solutions without success, you can always contact us at Pestico. 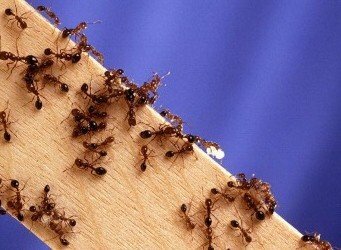 We specialize in pest removal, including ants in kitchens and gardens. You can visit our website to learn more about our service or call us to speak to a company representative.